In this interview, Howie Schecter talks about silver bookmarks, specifically the major manufacturers, designs, and the materials used to make them. Based in Los Angeles, Howie can be reached via his website, Silver Bookmarks, which is a member of our Hall of Fame. The next weekend, I went to the Rose Bowl and picked up a couple of silver bookmarks. I thought, ‘This is cool. Maybe I’ll start collecting them’ – have a little competition with my cousin. So I did. Six months later, I met up with her again in Las Vegas, and I brought my collection with me. At that time I had about 40. When we got to my aunt and uncle’s house, I showed her my collection and she was in awe. She could not believe how many I had. It turned out she only had two. She travels all over the world and looks for silver bookmarks specifically, and had only managed to find two. Now when we get together, we go out to antique stores. She’s got 22 now; I have 1,116. I stopped going to flea markets a few years ago because of eBay. I get most of my bookmarks from eBay now. I go to the high-end antique shows and pick up a few, but they’re really expensive, and on eBay you can get the same ones for a lot cheaper, so I mainly do my shopping from my keyboard. I started out picking up just about everything that was silver. I got into celluloid for a little while, but I stopped doing that. Now it’s mainly silver and sometimes antique brass, but if I see something really unusual and old, I’ll try to pick it up. I like the enameled ones, too. I have a sub-collection of bookmarks with enamel on them. Most bookmarks are paper, but I don’t collect paper bookmarks. Bookmarks were made of all kinds of materials, and I probably have some from almost every kind of material, but I mainly collect silver. Most of them come from England and the old silver manufacturers in the United States. Collectors Weekly: Are there a lot of silver bookmark collectors? Schecter: I only know of a few. People e-mail me all the time with questions about bookmarks, but I don’t think there are that many silver bookmark collectors. There are a lot of paper bookmark collectors, but not really the old, antique bookmarks. That kind of paper stuff is called ephemera. There are a whole bunch of people who collect ephemera, and that’s what most of the old bookmarks are. There are a lot of really valuable ones, but for me it’s hard to tell if it’s real or not because you can fake them on paper. It’s harder to fake the silver ones, and I can tell the new from the old, so I feel more comfortable with the silver. Collectors Weekly: When did bookmarks originate and who manufactured them? Schecter: The earliest ones I have – and this is just the silver ones – are probably from the late 1850s to early 1860s. My earliest one is from somewhere between 1855 and 1865. It’s hard to pin down an exact date, but it’s an old Gorham piece. You can tell the date by the shape of the hallmark on the back. They have a standard hallmark, but they have different features that allow you date it, so the one that I have seems to be from that time period. 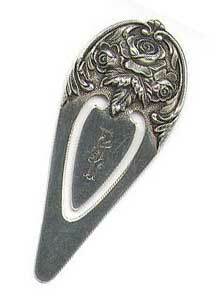 Most silver bookmarks are hallmarked. I think they had a law that the English ones had to be hallmarked. If its sterling, which is 0.925 percent silver, they have a date mark and a city mark. The ones I know of have three little hallmarks on them that tell you where they’re from and when they were crafted. The English ones also have a manufacturer’s mark sometimes, and with the American ones, you can tell who the manufacturer is based on the hallmark. They don’t necessarily print the name of the manufacturer, but the hallmark will give it away because each manufacturer has a unique hallmark. But some of them only marked Sterling with no manufacturer’s hallmark, so it’s really difficult to tell who manufactured them. Sometimes you can tell by the shape of the blades, but with a lot of them, it’s almost impossible. Some of the major silver bookmark manufacturers were Tiffany, Gorham, Shiebler, Unger Bros., and Towle. Most of them were in the northeast – Boston, New York, Rhode Island, and New England. Outside the United States, they’re mostly in Europe. The ones I have are mostly from England, Sweden, Norway, and Denmark. I have a few from Germany, but it’s mainly the Scandinavian countries and England. With the Scandinavian ones, it’s hard to tell the different countries. But you can tell it’s Scandinavian because they have similar themes and the blade shape is similar. Bookmarks were a very small part of what these manufacturers produced. Gorham is a big silver manufacturer; so is Tiffany. The manufacturers I mentioned at that time made novelties, and that’s what the bookmark was considered. The height of popularity for these silver bookmarks was the late 1800s through the early 1930s. That’s when the bulk of mine were made. Bookmarks are still popular today, but they’re getting less popular because people are reading less and less. Eventually the only bookmarks you’ll have will be the ones from the Internet. Collectors Weekly: What are the differences between modern and antique bookmarks? Schecter: The modern ones are usually very plain and not very ornate, whereas the old ones have a lot of different shapes and are very artistic. The ones today might have a little figure on top, but it’s not very detailed. They spent a lot of time on the old ones and you could really tell the quality. They had great artists doing these things, whereas today it’s a little flat. The modern Tiffany ones are basically just very flat, thin, and simple. Art Nouveau silver bookmarks are probably my favorite. They’re really detailed and ornate. But, again, if there’s something really interesting in another period, I’d pick that up as well. Collectors Weekly: Do collectors tend to focus on a specific theme, era, or manufacturer? Schecter: There really aren’t that many bookmark collectors. But what I’ve heard from talking to antique dealers at these antique shows is that some people like to collect the trowel. That’s a Masonic shape that’s very popular. Most of them are from England. Also, at the turn of the century, the pages of books weren’t cut very well so they stuck together. A lot of silver bookmarks look like knives because they were used as paper cutters to separate the pages when reading a book. My favorite manufacturer was Gorham. They were very popular in the beginning of the 20th century. There are a bunch of books on them. Bookmarks were only a small part of what they made, but I’m only interested in the bookmarks. Every now and then I get a letter opener, but usually it’s because the person selling it thought it was a bookmark. Sometimes I guess they can be considered bookmarks if they’re small enough, but it’s more likely that they’re a page cutter. A bookmark without the two blades would probably get lost fairly easy because they’d just slip through the book. If you had the clip on it, it would be more likely to stay. Actually, the most common bookmark is just a piece of paper that you tear off from something and put it in the book. In fact, silver bookmarks are really bad for rare books because the silver comes off on the pages, so if you’ve got a really old book, I would highly recommend not putting a silver bookmark in it. It puts an imprint on the pages, too, depending on the kind of clip it is. There are different kinds. There are overlapping clips, one where a smaller blade is on top of the longer blades, and one where the blade is inside the outer blade. That’s more like a paperclip. Collectors Weekly: Do some of these bookmarks incorporate other materials, like jewels? Schecter: Yes. Some are enamel. Some have agate handles. There’s one that I thought was a ruby, but it’s not really. They don’t really use precious stones. They’re more likely glass or something like that, but they do mix materials. Another manufacturer, Heintz Art Metal Shop, did silver on top of bronze. They had some interesting techniques. In the 19th and 20th century, you probably had to be rich to have silver bookmarks. They cost a dollar or two, but that was a lot of money back then. Today they range in price anywhere from $20 to $200, but you can pay $1,000. That would be rare, but I’ve seen it. The most expensive one I’ve seen went for $4,000. It was supposedly a Fabergé. The rarity and quality and design of the bookmark is what makes it expensive. Anything Fabergé is going to be expensive. If it looks nice, people want it. Sometimes the manufacturer will make it more valuable. I collect Gorham, so I’ll spend a little more money if I can find a Gorham. They’re really hard to find. If you look at that 1888 catalog page for Gorham that I have on my website, I’m trying to get all of those from that catalog. I did the whole website myself because I’m a computer programmer, so I designed and built the whole thing. It’s got all kinds of stuff in there. Maintaining the site is almost as much fun for me as collecting bookmarks. Collectors Weekly: Is there a club for bookmark collectors? Schecter: I don’t really know of any specifically. There’s a great website about bookmarks called Mirage Bookmark. A woman used to have a newsletter on bookmarks, but I don’t think she does it anymore. It was a periodical-type thing, all on paper. You sent her money and every quarter or something she sent to you a few pages that she wrote. I have four books and I can’t find any other ones. One of them I can’t even read because it’s in German. I actually correspond with the author of that and I asked him if he was going to translate it. He said possibly, but not in the near future. The big one is Collecting Bookmarkers by A.W. Coysh, written in the ‘70s. He wrote another one, more of a pamphlet than a book, called Bookmarkers, by A.W. Coysh and R.K. Henrywood. It’s mainly about the paper bookmarks because most of the bookmarks out there are paper. The paper bookmarks eventually became advertising. The celluloid ones are mainly advertising or religious. Some had prayers on them or quotes from the Bible, but mostly it was advertising. The most expensive paper ones are the Coke ones. I’ve collected Coca-Cola from the early 1900s, and those go for $600 to $700 apiece. I even have bookmarks as prizes from the Cracker Jack boxes. They made four of them. I have all of those. Collectors Weekly: Are there fakes or reproduction silver bookmarks? Schecter: I’ve seen a couple reproductions made in pewter. I actually bought one that I thought was gold and silver, but it turned out to be a repro of a pewter one. But now I can tell. They used to have those stores where they do engraving. You buy these cheap things and they engrave them for you at the mall. I remember I saw a bunch of bookmarks made out of pewter in one of those stores that were repros of forms that I recognized from my collection. A lot of them are made in Thailand. Collectors Weekly: Do you collect newer bookmarks, too? Schecter: I focus more on the old ones, and I don’t think I have any brand new ones. I may have some from the ‘80s and I have some of the Tiffany ones which were probably from the ‘70s, but I don’t really have too many that are newer. The bulk of my collection is from between 1900 and 1910. I keep my bookmarks in an antique cabinet. It’s like a filing cabinet, about four feet high with 24 drawers, each only an inch high. I just lay them out flat in the drawers and keep them in there. Collectors Weekly: Do you think bookmark collecting as a hobby is going to get bigger? Schecter: I think it will. You have tobacciana, where people collect match safes. At the turn of the century, they carried matches in this little silver box called a match safe. When people stopped smoking a lot, that became more popular to collect. Now regular cigarette lighters are becoming very popular to collect because people are smoking less, so there’s fewer of them around. So I’m hoping people will get very interested in these so my collection value will go up. I’ve set up my website so that eventually, when I get tired of these things, I can just sell them. Not anytime soon, though. I still like them. There are a growing number of sites and blogs that focus on bookmarks. Five years ago, you found very little but now the number of people interested in collecting them has grown. My website, BiblioBuffet.com, which is found at http://www.bibliobuffet.com/content/blogcategory/31/195/ , has a column called On Marking Books in which my co-writer and I put out a weekly column on them. And I also have a page which lists a number of bookmark sites and blogs — http://www.bibliobuffet.com/content/view/19/290/ that make for wonderful reading. In addition to Mirage, which Howard mentioned, Bookmark Collector, is quite good. I am delighted to learn that there is a growing interest in collecting bookmarks. I started a few years ago and am not so discriminating as Howard. It has proved to be a wonderful collection of memorabilia, gifts from friends and family, and souvenirs of wonderful places I have enjoyed. I particularly enjoy seeing the diversity of materials used. My most valuable one is from a defunct mill in England, woven in 1976 in commemoration of the American bicentennial and found in an English antique shop. I see no S. in front of KIRK. Now, I have seen others of these bookmarks where the concave rose pattern is on the back and the lettering down on the “tongue”. My back is smooth and the lettering is all at the top. Does this in some way date the item to a certain period? “ ” Toy butcher shops had modeled joints, strings of sausages, and animal carcasses hanging from hooks.